Meat brings pleasure when it is of good quality, varied and well cooked! Beef, pork, chicken, turkey, rabbit, game, smoked, stewed, roasted, boiled, grilled marinated... challenges and choices are plenty, but one is for sure and never changes: the meat has to be of high quality and fresh! 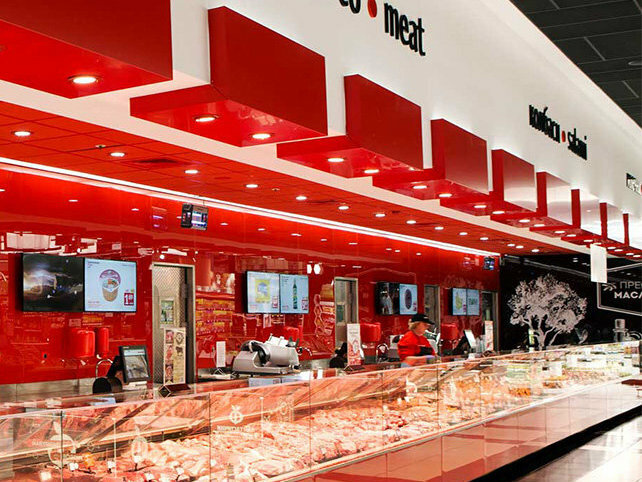 \you can choose yourself at our service counters the meat, the size of piece, ask to have it minced, get information or useful advice you need. What is important for us is that you purchase exactly what you have expected and give you rich choice of high quality and fresh products. And if you want to vary your diet with a new meal or you need advice how to cook the meat best, our culinary columns will help you with advice, recipes and videos which will assist you to make your relatives and friends with a tasty cooked food.